Connor McDavid had a pair of assists and Mikko Koskinen made 35 saves as the Edmonton Oilers continued to make a late playoff push with a 3-2 victory over the Vancouver Canucks on Thursday. The Edmonton Oilers haven't given up yet. Connor McDavid had a pair of assists and Mikko Koskinen made 35 saves as the Oilers continued to make a late playoff push with a 3-2 victory over the Vancouver Canucks on Thursday. Alex Chiasson, Zack Kassian and Ryan Nugent-Hopkins scored for the Oilers (30-30-7), who have won four straight games and are 6-1-2 in their last nine outings to move within seven points of Minnesota for the second wild card in the West. "We just have to keep it going," said Oilers defenceman Oscar Klefbom. "We cannot be satisfied. We're still out of the playoffs. Every game is like a playoff game for us. It's important. There's a lot of teams in it right now and Minny won tonight in Tampa and Dallas won and they're winning some games, too. We cannot be happy, we have to keep winning games because we've put ourselves in this situation and now we have to make sure we keep going here." "You continue to build confidence through wins, and it helps you get better at managing that," added Oilers forward Sam Gagner. "We're getting better at finding ways to get wins." Jay Beagle and Alexander Edler replied for the Canucks (28-31-9), who have lost four of their last five. "We have a lot of resiliency and a lot of heart and have a lot of guys who don't quit," said Beagle, whose team came back from a 3-0 deficit to make a go of it against the Oilers after staging a successful comeback against Toronto on Wednesday. "But when you go down by three it is tough, especially on a back-to-back on the road. We showed a lot of heart in never quitting." 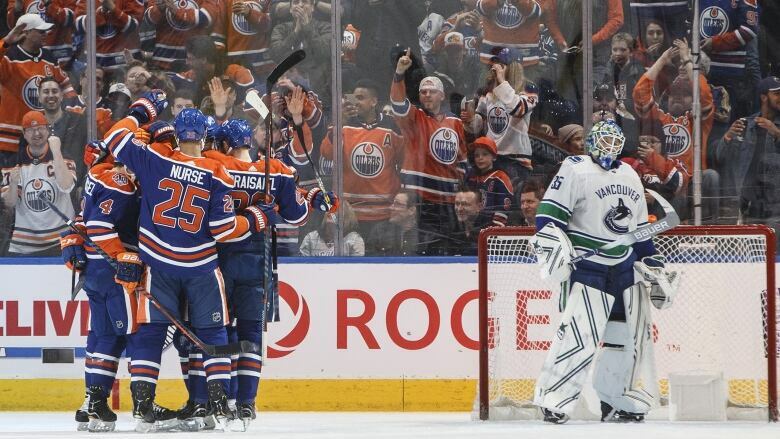 Edmonton started the scoring just over five minutes into the first period when former Canuck Gagner stole a puck behind the net and fed it in front to Chiasson, who sent a shot through the legs of Vancouver goalie Thatcher Demko for his 19th of the season. The Oilers made it 2-0 with six minutes left in the opening frame when McDavid shrugged off a check at full speed and sent it in front for Kassian to deflect it into the net, the fourth consecutive game in which he has scored a goal. Koskinen kept that lead intact late in the first, making a pad save on a point-blank shot by Josh Leivo. The Oilers added to their lead one minute into the second period when McDavid saw Nugent-Hopkins at the back door and he was able to redirect in his 21st goal of the season. Vancouver got on the board with 1:30 left in the second when Koskinen mishandled a shot and Beagle poked in a puck that was sitting on the goal line. The Canucks cut the lead to one seven minutes into the third period on a point shot from Edler, a play which survived a challenge for goaltender interference. Both teams return to action on Saturday, with the Oilers hosting the Toronto Maple Leafs and the Canucks returning home to face the Vegas Golden Knights.